If you are looking for a solid foundation on how to photograph the night sky, Phil Hart's "Shooting Stars" eBook is an excellent resource. Shooting Stars - How to Photograph the Moon and Stars with your DSLR is an eBook written and published by Phil Hart, (129 pages, version 1.2, © 2012), and sold through e-Junkie.com for $19.95. Although I was hoping to find more images to inspire me in my astro-landscape photography, what I found instead was a well designed ebook that contained good how-to information, with lots of informative charts, illustrations, and photo examples. In my opinion, this ebook is positioned for the beginning and intermediate night photographer, but even the experienced nightscape shooter is going to find a few ideas and techniques that will improve their nocturnal work. As for the inspiration, I suggest you follow my Night Photography Favorites on 500px! Two image examples from the ebook, Shooting Stars, that did inspire me. Sample page layouts from Shooting Stars. The Sky at Night section has 18 pages of basic charts and illustrations that show the starry night sky through the seasons, as well as phases of the moon. Three pages on light pollution and weather provide useful hot links to additional online charts, maps, and current conditions in your geographic area of interest. 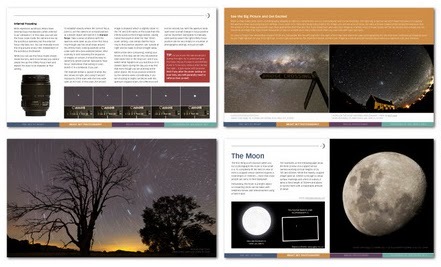 Night Sky Photography section has 50 how-to pages. 23 pages are devoted to using your camera at night: how to choose the best lenses, how focus at night, what shutter speeds to use for various night situations, what ISO to use, and how to reduce noise. Tripods, remote releases, batteries, flashlights, clothing, and dew heaters are among the many equipment accessories that are discussed. Four pages cover twilight (or "blue hour) photography techniques, and 15 pages are devoted starry night photography. These sections provide photographers with an excellent foundation. They are nicely illustrated and explained in an easy-to-understand way methods that some find a little overwhelming. The four pages covering moon photography was the weakest section, and light painting was only given a casual mention on page 60. Image Processing section has 19 pages of examples on basic night sky post processing via Photoshop, Lightroom, Aperture, and ACDSee Pro software. 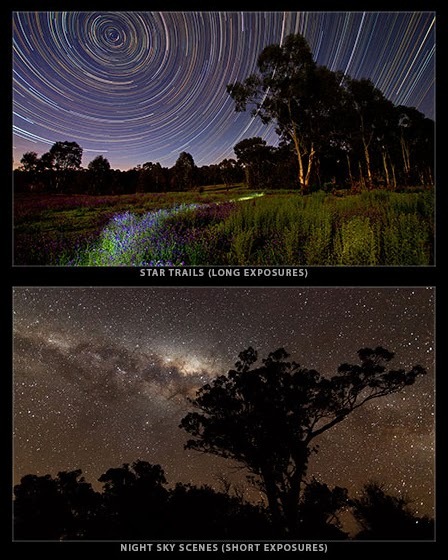 There is also a short subsection on star trail stacking and time-lapse video processing. The first four pages give examples of how your brightness levels and histogram should appear when you first review your images on camera, as well as discussing white balance. Wonders of the Night Sky covers 33 pages about how to recognize, find, and photograph the Milky Way, meteors, comets, satellite flares, Zodiacal light, planetary conjunctions, noctilucent clouds, the Aurora Borealis, and even bioluminescence in our oceans. There is also a Field Guide in the back of the book that provides a camera settings cheat sheet for shooting various night sky situations, including useful information on how to use your camera in the manual mode for Canon, Nikon, Pentax, Olympus, and Sony shooters. Conclusion: Until I read Phil's book, I hadn't stopped to realize what a broad subject this book covers! He has done an excellent job in covering the subject in only 129 pages. Each subtopic is clearly explained and illustrated. Although he gives sufficient coverage for the average photographer, some areas could use further development. Advanced night photographers will be left wanting more technical information on some topics. Although have been fairly critical of this ebook, I would still strongly recommend it to anyone who plans on taking one of my workshops. If they study it before coming, they will be better prepared and have a more enjoyable experience. Those who have already experienced one of my lectures or workshops will not only find this a good refresher, but will be given a taste of other nocturnal adventures they might wish to pursue. 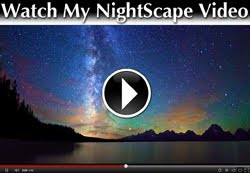 UPDATE (May 2014): I reviewed another night photography ebook, "NIGHTSCAPE - A Complete Guide to Photographing Under the Night Sky" by David Kingham. Although I highly recommend both books, I think photographers wanting to do my style of astro-landscape night photography will find a greater depth of information in Kingham's book. "[This] book covers basic knowledge of the night sky and camera equipment needed to capture its beauty, to more advanced techniques and settings to produce great night photos, including Milky Way and star trails photos. "In later chapters, the book gets a little more in-depth, and I found several of the chapters on some advanced techniques very interesting. Star trails, and star trail image stacking is something that I have wanted to do for some time, but haven’t yet. "Shooting Stars is a valuable and very reasonably price e-book that offers a comprehensive guide for night sky photography; there is something for every level of photographer here. The illustrations are graphic and well thought out, so even a first casual glance through the book is productive. "If you are a beginning star shooter who is into the quick-start method, begin on page 31 and read about focusing; also take a look at/print out the “Camera Settings Cheat Sheet” on page 131. Then get out there and start shooting. 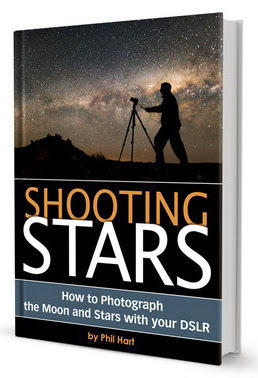 "If you are an intermediate night photographer, you might want to review the author’s Image Processing Steps starting on page 79; ... You will find there are many different approaches to processing star shots, so this is just one experienced photographer’s approach; consider it as a starting point on an interesting journey. "For advanced night photographers, this will whet your appetite to be under the stars capturing the glory of the night sky, and will get your creative juices flowing. If you are having issues with star timelapse sequences, you might be interested in some of Phil’s advice in this area. "Phil Hart’s Shooting Stars is a comprehensive, well organized, and easy to navigate resource for night photographers, and will be a welcome addition in anyone’s e-book library. Featured Post: Royce Bair's 2014 Workshop Schedule — Learn how to photograph Milky Way NightScapes and more! Got it, thx for a discount Royce! Thanks for bringing this book to my attention and for the discount code Royce! I've just bought it and I'm loading it onto my Kindle Fire HD now. I can't wait to read it and start practicing.